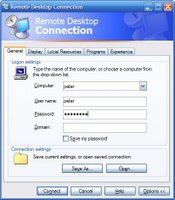 If you have ever needed to access your XP Professional computer remotely you should use the included Remote Desktop Connection software. 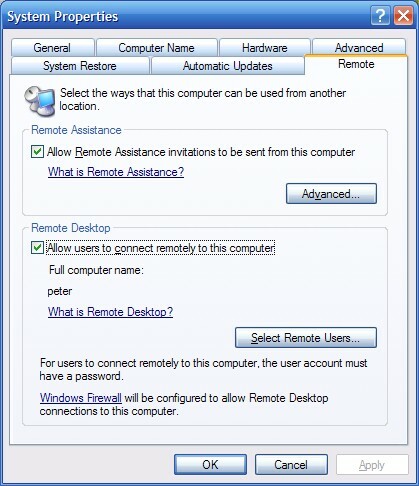 This howto will show how to enable remote desktop connection and how to change it to allow an unlimited number of connections. To enable this, right click my computer, press properties, switch to the Remote tab and check the box that says "Allow users to connect remotely to this computer". 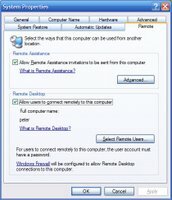 Now any account on the computer which has a password should be able to remotely connect to this computer using Microsoft's Remote Desktop Connection client found in Start\All Programs\Accesories\Communications\Remote Desktop Connection or on Microsoft's website for older versions of windows. The Remote Desktop Connection client looks like this. If it is smaller, press the "Options >>" button. This allows you to enter the username and password before connecting so that you may skip the login screen. One ProblemThere is one problem with Remote Desktop Connection that is a little annoying. 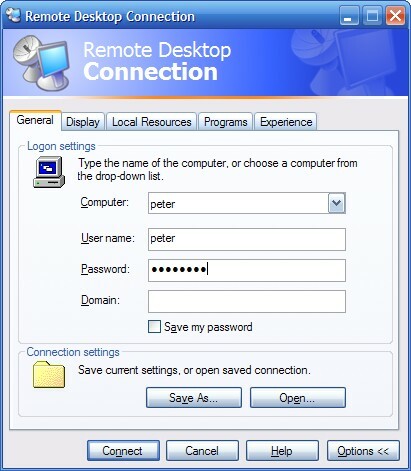 You may only have one person logged into the computer at once, be it via Remote Desktop Connection or locally. Meaning if someone is using the computer, you can not connect remotely without them logging off, or if you are connected remotely and someone logs on then you get kicked off. The solution to this problem is simple. sala source developed a patch for the terminal server. All you need to do is go to their website and download the latest binary. Once the download is complete, run the program. The program will patch some files, do not allow Windows to "fix" the files it patched and if you have the Windows XP CD in your drive, remove it. Once complete, you will need to restart and you can now log in from any palce as many times as you wish.